GRRRR’s Mural at 245 E 2nd St. | Allied Productions, Inc.
GRRRR’s Mural at 245 E 2nd St. This post is a historical document. Though this post was really written and posted in 2010, we have dated it to the summer of 2002 because that is when the mural was painted. As you can see by reading about our Mural Project, the facade of 245 E 2nd St. has undergone many beautiful transformations during Allied’s tenure. This mural was painted by GRRRR when we first opened Le Petit Versailles garden! It was a magical extension of the garden, as though it’s leaves were spilling out of it’s lot and spreading, giving life to the walls of the adjacent building. 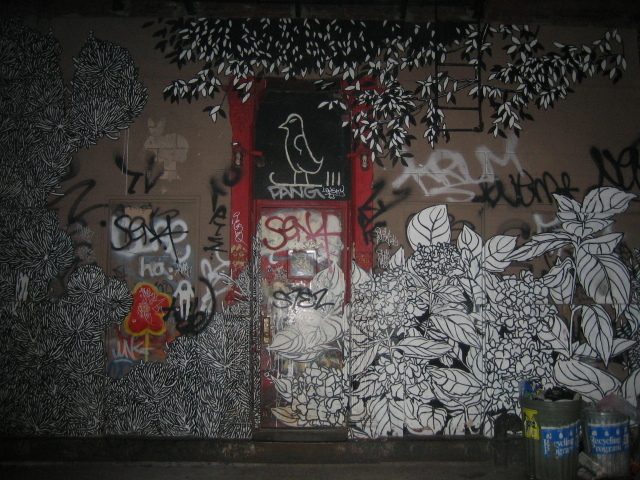 Over the years, the mural degenerated, like an overgrowth of the garden in turn being overgrown by the work of other graffiti artists, until it became a complex collage that captured many aesthetics, among them the distinct beauty of the passage of time. The mural was painted over in 2007. In 2008 it was replaced by a new mural by Carlo Quispe and Laura Campos. THE WORLD IS A TERRIBLE PLACE! The Evolving Face of 245 E 2nd St.